Typically less than 1% cross reactivity against other types of apoLipoprotein was detected by ELISA. 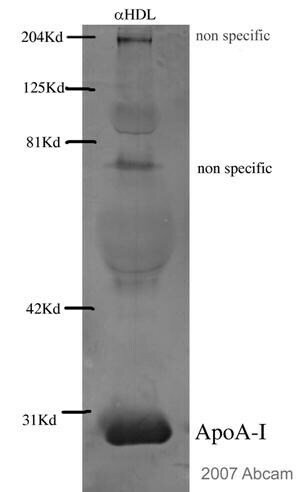 This antibody reacts with human apoLipoprotein A-I and has negligible cross-reactivity with Type A-II, B, C-I, C-II, C-III, E and J apoLipoproteins. Full length native apoLipoprotein Type A-I (purified). 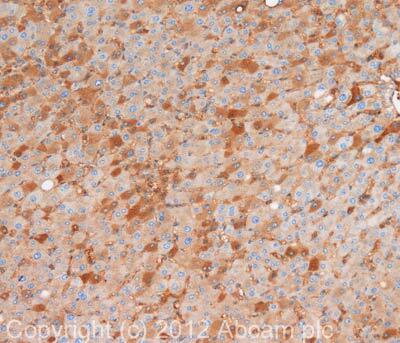 IHC-P: normal human liver tissue. Our Abpromise guarantee covers the use of ab7613 in the following tested applications. Can be paired with ab20784 for sandwich ELISA. IHC image of Apolipoprotein A I staining in human normal liver formalin fixed paraffin embedded tissue section, performed on a Leica BondTM system using the standard protocol B. The section was pre-treated using heat mediated antigen retrieval with sodium citrate buffer (pH6, epitope retrieval solution 1) for 20 mins. The section was then incubated with ab7613, 1µg/ml, for 15 mins at room temperature. 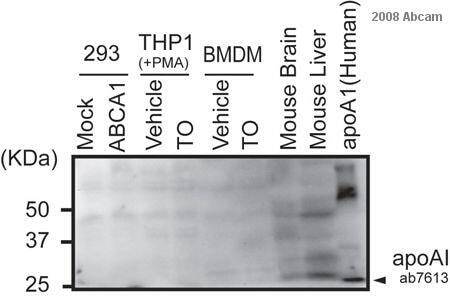 A donkey anti-goat biotinylated secondary antibody was used to detect the primary, and visualized using an HRP conjugated ABC system. DAB was used as the chromogen. The section was then counterstained with haematoxylin and mounted with DPX. Publishing research using ab7613? Please let us know so that we can cite the reference in this datasheet. We havenot tested ab7613specifically against plasminogen, and cross-reaction with plasminogen is not detectable by our QC Testing. Please let me know if you have any further.